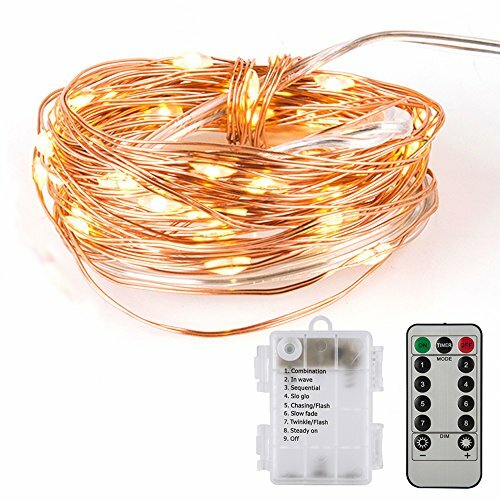 Copper String Light: Thin copper string light with 50LEDs,It is very flexible and could be easily bentto whatever shape as you likeand wrapped aroundstatus, trees, etc. Remote control & Timer: To control 8 modes of the lighting and timer,adjust the brightness also. Battery Powered: It is powered by 3 AA batteries(not included),and the battery box is water-resistant.No buttons needed,all control by the controller. Wide Application: Wonderful decoration for your holiday, wedding, party and Christmas gathering. 50 LEDs warm white lights creates a romance and festive ambiance to your family and your friends.